Behind Mona Lisa's Smile: Another Woman? (Newser) – Will the real Mona Lisa please stand up—or at least send us a signal from within the paint layers? The art world is buzzing over a French scientist's claims that he discovered a portrait of another woman lurking beneath the top layer of the world's most famous painting—meaning the Mona Lisa as we know her might not be the real her, the BBC reports. Pascal Cotte, who co-founded a Paris-based company that digitizes fine art, has been studying Da Vinci's signature piece for 10 years using a technology called the Layer Amplification Method, or LAM, which involves shining "intense" light onto a painting, then measuring the bounced-back reflections to gauge what's underneath, per Newsweek. And what Cotte says is underneath the surface of the Mona Lisa is an image of a woman looking off to the side (not straight ahead) with different physical characteristics than the model that currently smiles down on crowds at the Louvre. There are more secrets. In the 1980s I painted another Mona Lisa and sold it at auction (signed on the back with my name). It took 6 weeks to paint. Leo forgot the eye brows. The secret to no brush strokes on her face is Leo used his finger tip to blend the paint. Mona is not painted on canvas but on very smooth wood . The woman is Leo's mom. 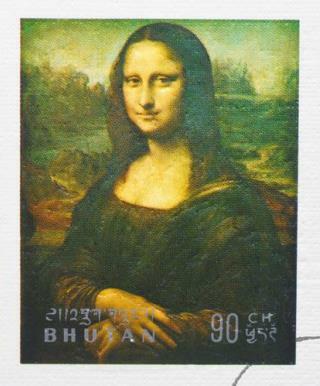 Newser couldn't find a better image than a Mona Lisa reproduction on a postage stamp from the Asian country of Bhouta with Tibetan writing on it? I have never understood the world's obsession with such a homely looking woman. And as for her famous smile.....give me a break.